Why Should I Use Marine Gro? 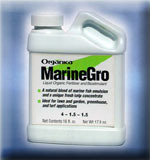 Organica Marine Gro is an natural product consisting entirely of fish emulsion and kelp. This proprietary formulation consists of fish emulsion, plant growth hormones (auxins & cytokinins), micro-nutrients, amino acids and vitamins. Unlike some competitive products which are fortified with other ingredients, the nitrogen, phosphorous and potassium contained in MarineGro are derived solely from fish protein. MarineGro's plant growth hormone component is derived from a unique kelp formulation. The kelp portion of this product is manufactured by a patented process, which utilizes cold water and mechanical micronization. Due to this unique "cell burst" technology, MarineGro contains significantly higher levels of natural plant growth hormones (cytokinins & auxins) than other competitive products. Plant growth hormones have been scientifically proven to stimulate growth, enlarge root systems, and provide increased resistance to environmental stress. Specifications Marine Gro is natural blend of fish emulsion and fresh ecklonia maxima sea kelp in liquid form, available in 1 or 6.6 gallon containers. It is filtered for use in conventional sprayers or fertigation units.